UPDATE! 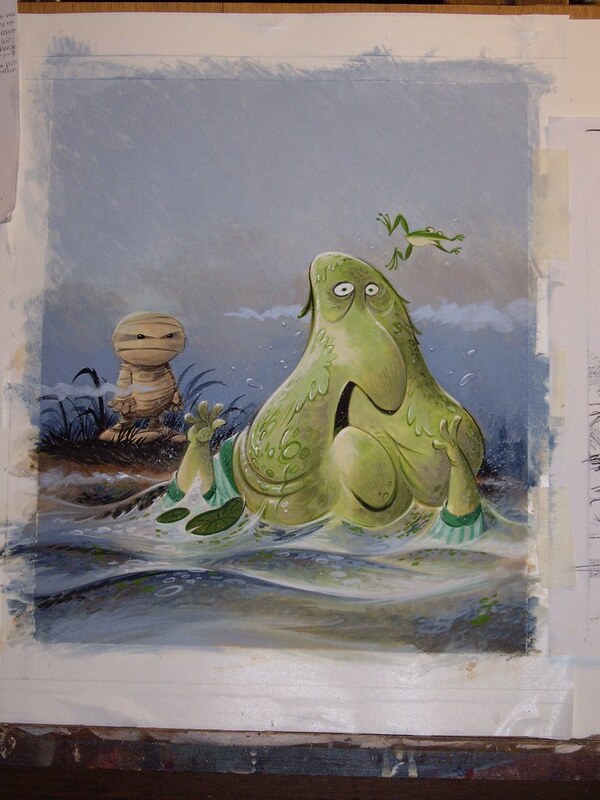 Ilene, Jerry & Drake discuss digital vs traditional illustration in the comments section below. 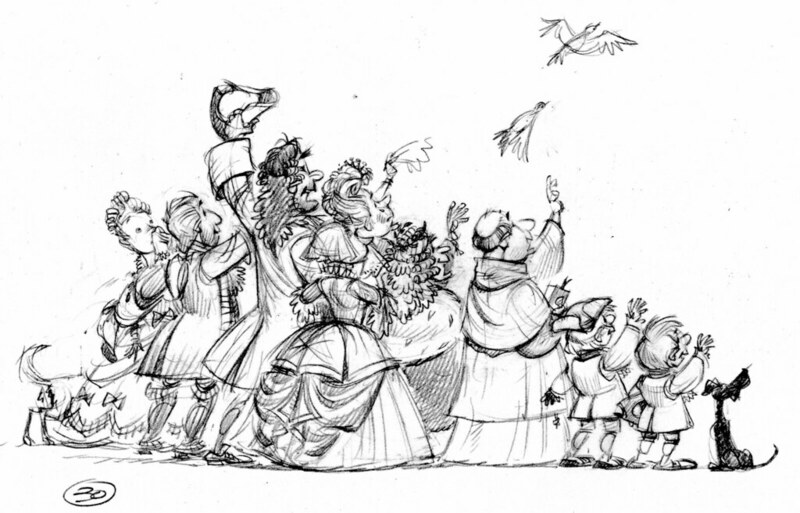 I get quite a few historical projects to illustrate, and that suits me fine. I enjoy doing the research—which is crucial to making the costumes and settings authentic. And here’s the tight sketch. Remember, the thumbnail sketch is pretty small, about an inch-and-a-half tall. My tight sketch is usually half the size of the printed page. I usually paint at the same size as the image will be printed. The compass in the wooden case shown here belonged to Lewis & Clark. Here’s another one. The squares with an ‘x’ through them show where the text will go. This was a fun little book to do. It’s 48 pages long, which is much longer than normal (32 pages). But it’s smaller in size than most picture books. Below is what I mean by historical costume. I had no reference for Sacajewea, but used a drawing George Catlin had made of a young woman from Sacajewea’s tribe thirty years after her adventure with Lewis & Clark. Here’s a comp (short for comprehensive layout) of the book’s cover. It shows the type and the sketch together. The next step is for me to paint the sketch portion. Oh, boy. It looks like Spike Jonze is giving Where The Wild Things Are the same psychoanalytical grilling the Grinch got in his movie. Goodness knows I’m happy for Maurice Sendak—and I’d be the happiest boy in the world if the cinema gods smiled upon a book of mine. But I’m apprehensive when kids’ books get made into movies. A big part of what makes this book a masterpiece is the ruthless editing and paring-down Sendak did in order to give the reader just enough information to set his own imagination running. George Bernard Shaw said successful theater requires that the audience do fifty per cent of the work. I believe that rule goes for children’s books, too. So, to fill up an hour-and-a-half the movie’s creative team will be running pins into Max to see what makes him tick—so expect exposition galore—as well as giving the wild things all kinds of stage business and smart-alecky one-liners. I suspect there will be Important Messages about Family and Relationships and Understanding People Who Are Different and Bullying and Staying Away From Fatty Foods. Yes, I’ll go see it. I’ll be the cranky old guy harrumphing in the back row. 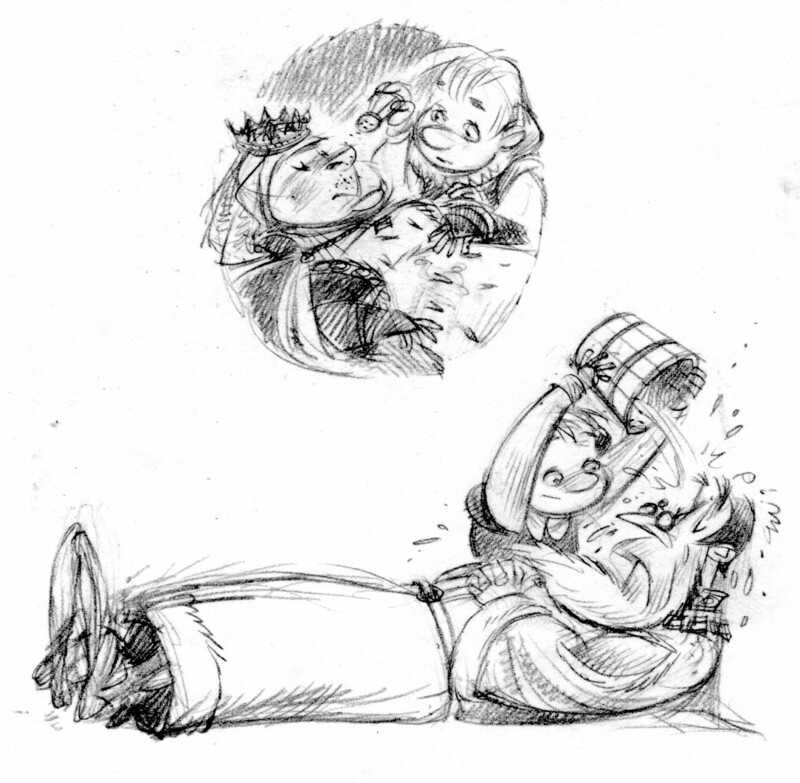 Apropos of nothing, some old sketches from Humphrey, Albert & the Flying Machine. This one was written by Kathryn Lasky, who also wrote Two Bad Pilgrims—coming this Fall! Humphrey is set within the Sleeping Beauty story, about two boys who attend Briar Rose’s 16th birthday party and succumb to the sleeping spell along with the other guests. Having slept 99 years and 51 weeks, they wake up earlier than everyone else and set out to find a handsome prince to break the enchantment. Here are a couple of cover ideas. I like to listen to really old classical music, and have attended the wonderful concerts organized by the Renaissance & Baroque Society of Pittsburgh. I do illustrations for their season brochures. A couple of years ago they booked the group Hesperus, who had the clever idea to perform a renaissance/medieval soundtrack to Douglas Fairbanks’ silent movie Robin Hood. My buddy Ann Mason, who was executive director at the time, asked me to do a poster illustration for this special concert. How could I resist? 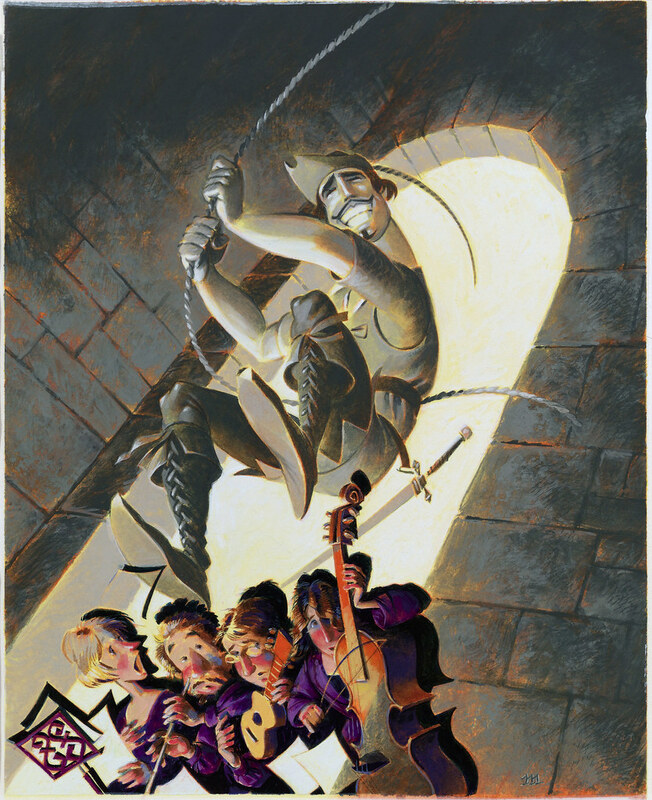 I wanted to show the musicians superimposed on a larger-than-life Douglas Fairbanks, and somehow interacting with him. I remembered a scene from the movie My Favorite Year, in which Peter O’Toole (essentially playing Errol Flynn) drunkenly walks into a screening of one of his old movies and begins sword-fighting his own projected image. To separate the musicians from Fairbanks, I chose to paint them in color and him black & white—that’s a no-brainer. Also, they will be lighted from below (as they turned out to be during the performance) while Fairbanks would be lighted from the left. They will cast hard shadows onto the b&w image to keep up the illusion of a projected movie. The perspective for Fairbanks is different and far more dramatic than for the musicians—we’re looking at him from a bug’s-eye view; the musicians are level with our own horizon. As usual with my perspective exercises, if you take a ruler to it and try to find a vanishing point you’ll be doomed to disappointment. The vanishing points are there, somewhere, but I don’t strictly adhere to them. I did a burnt sienna underpainting even for the black and white portion. I think it warms it up a bit. I’ll be away for a week, immersing my lily-white bod’ in the surf. 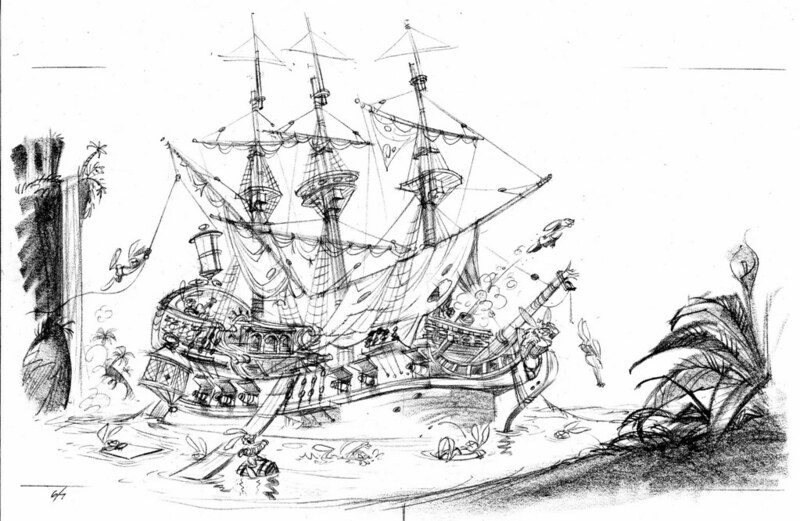 Here’s the thumbnail sketch for the opening spread of Henry & the Crazed Chicken Pirates. Like in a movie, this establishing shot offers a broad swathe of visual information that tells the reader where the story takes place. The crew of the Salty Carrot frolics in a tropical lagoon where their dear old barky is moored. The art director asked that the image be flopped—the ship should face right instead of left. I begin tracing the ship drawing on a piece of translucent paper through which you can see the layout with the enlarged thumbnail. 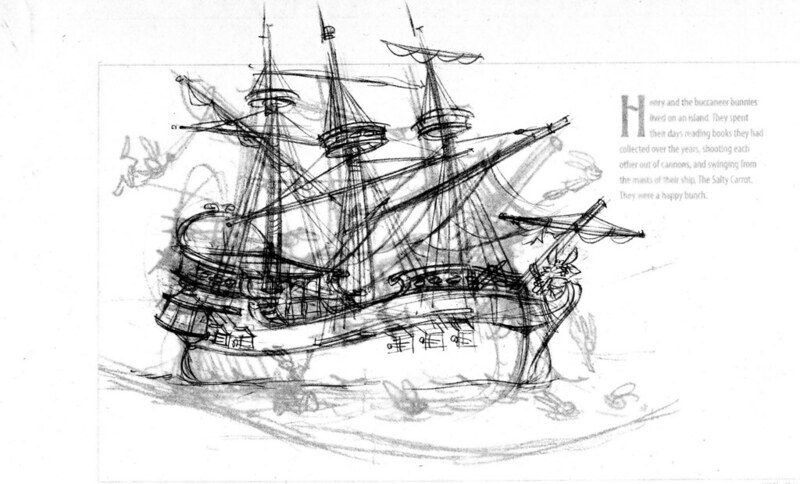 Ships are complicated things to draw. I trace the scene at least one more time. I like to place something like foliage in the foreground, so the reader has the sensation of looking through one plane to see another. To make this scene truly idyllic, I added a waterfall in the background. I want to warn you ahead of time that I don’t have the finished illustration that would normally follow the series of sketches below. I must have gotten rid of it, or else it’s boxed away somewhere in my attic (I moved last November and am still unpacking). A while back I got an assignment to illustrate a cover for a summer issue of StoryWorks magazine. The art director asked for fireflies reading books. Sounds like a fun idea—I went to work drawing variations of it. I wasn’t happy with it. Too many elements, too difficult to read the idea. I would have loved to paint any of the other sketches, but it wasn’t meant to be. Nobody’s fault; the art director and I just had different tastes. That’s the way it goes sometimes. You do your work, get your paycheck, and move on. Another discussion about how much to charge for creative work here. Keep in mind that your day- or hourly- rate is your minimum—it’s what you need to make in order to survive. What you charge may exceed your rate. It’s not how much your overhead costs, it’s what you can negotiate. For more info on what graphic artists are charging, take a look at the Graphic Artists’ Guild’s Pricing & Ethical Guidelines.